Part of the thrill (and the stress) of being a homeowner are home repairs and home improvements including fence installation. If you are considering whether or not to have a fence installed on your property, one deciding factor will be the cost. Money doesn’t grow on trees and you need to watch your dollars. You don’t want it to be expensive, but you don’t want it to be dirt cheap either because when it comes to home improvements you get what you pay for. So, how much does it cost to install a fence? Although that may seem like we are dodging the question, the fact is there are so many variables that affect the cost of the fence that there is no way of giving you an accurate price without having more information about your particular fencing needs. The lay of the land. Is your property flat or is it on a slope? If it’s on a slope, what is the grade of the slope? Those factors go into determining a price. The exact measurements. From time to time we have customers call and ask for a price and they mention that their yard is “not very big.” The truth is we cannot give an accurate cost estimate until we actually come to the property and take exact measurements. The fencing material. Aluminum, chain link, wood, split rail, or vinyl? Once you have narrowed down what material you would like your fence to be, there are different styles and colors of those material options that determine the price. Gates or no gates. That is the question. If you want gates in your fence design, the size and number of gates will factor into the installation cost. The fence height. The average fence height is six feet tall. However, pool fencing, dog kennel fencing, and decorative fencing all come with their own height requirements. Permits. Each township and municipality has different rules and regulations about fencing permits. The permits cost money and will be figured into your cost. Since we have been in the fencing business for many years, we can save you the hassle of investigating from scratch the needed permits. The best way to find out for sure how much your fence installation will cost is to invite a fencing professional to come to your property and give you a personalized estimate. If you are in the Hamilton New Jersey area, contact Horner Brothers to get a quote. Horner Brothers are known for their fair prices, easy-to-work-with team, and high-quality workmanship. Jackie, on Facebook, let Horner Brothers know that she loves her red cedar fence and that Horner Brother’s price was the best. 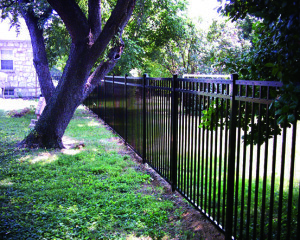 Take the mystery out of the cost of fence installation. Contact us today for an estimate.